What if you could live on a 12,000-acre estate, a “humble cottage”with over 187 rooms or a property boasting a 38,000 square foot cast iron Aviary? For sixteen noble families, this is real life as chronicled within the glorious book- Great Houses, Modern Aristocrats by James Reginato. A literary and visual celebration rich in family history which has taken place over centuries of political upheaval, conflict, and more than a few salacious scandals. There is something quite intriguing watching layers of compelling events unfold and even more so when it’s thoughtfully composed to be enjoyed and savored. The history of England woven around generations of aristocratic families who have taken stewardship of 16 magnificent properties each leaving an indelible mark. From St. Giles Houses in Dorset England to the extraordinary Waddesdon Manor in Buckinghamshire, England the interiors are as impressive as some of the anecdotes. Reginato has humanized the owners of these magnificent estates and proven perhaps that they are much like us with the exception of a few gilded palaces. This book is without a doubt an essential addition to a design and architectural enthusiasts library. 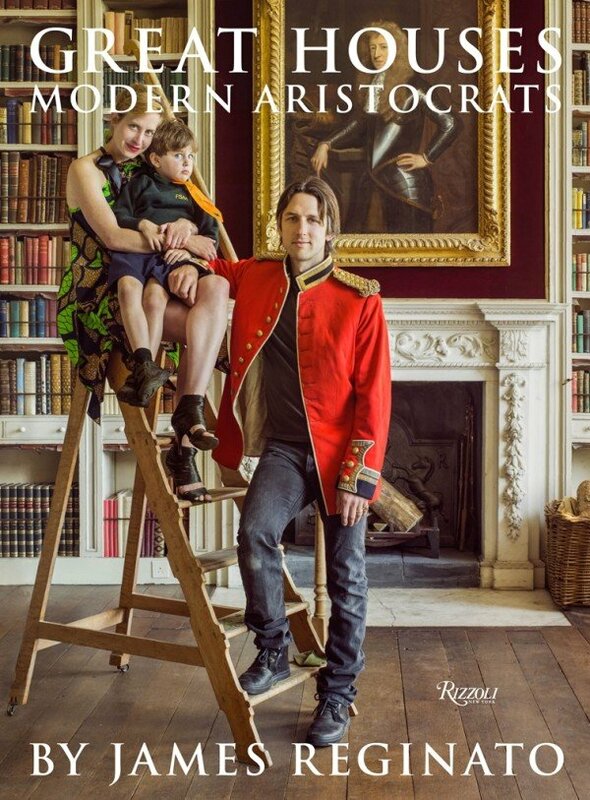 We are giving just a brief preview of 7 of the great houses of modern aristocrats. With seven acres under its roof, Blenheim is the only non-royal dwelling in England called a palace. With it’s 187 rooms and staff of 158, Blenheim is still considered one of the first “great houses” in Great Britain. 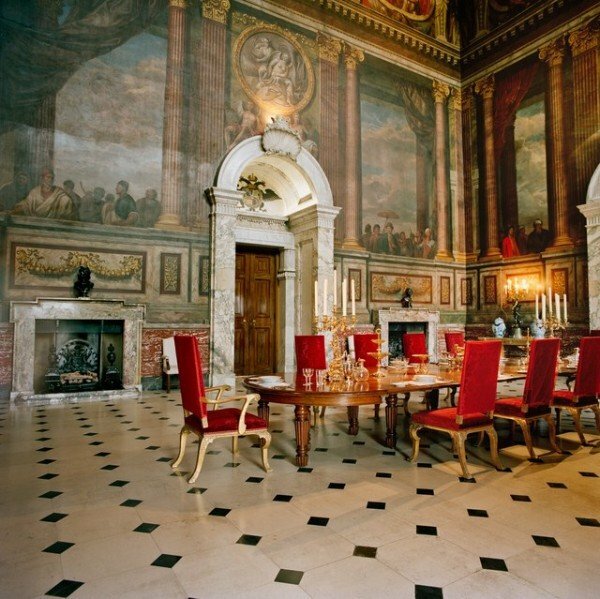 Pictured is the Saloon, “one of the magnificent state rooms decorated by Louis Laguerre. The palace with the exception of the “loos” is open to the public. Broughton Castle has served as the film set for a few major motion pictures including”Shakesphere in Love.” This “fortified manor home” built in 1377 also counts a moat as one of its unique features. The owners, Lord and Lady Saye and Sele believe that “you’ve got to bring in new things, otherwise a room fossilizes.” Which explains the modernization of this grand estate including the ground floor room of the Tudor west wing (pictured above), now known as the Oak Room, which was built on the foundations of the fourteenth-century kitchens. It was “de rigour” in the 18th and 19 century England to own both a “residence” in London and a large estate in the country. Since 1730 the Dudley House was the in-town residence of the Ward Family. Painstakingly restored beginning in 2006, the 44,000 square foot home “features an eighty-one-foot long picture gallery and a fifty-foot ballroom.” Upon visiting the Dudley House for supper, Her Majesty Queen Elizabeth remarked, “This place makes Buckingham Palace look rather dull.” Above: The conservatory overlooking Hyde Park. Built in 1697 this West Sussex estate holds the distinction of being “England’s greatest sporting estate,” from fox hunting to a motor racing track (which attracts more than 350,00 visitors each year). Pictured above the balconied small library which the owner uses as his study. Stripped of over 200 masterpieces of art in 1779, Houghton Hall was temporarily loaned back 70 pictures in 2013 during an unprecedented exhibition, “Houghton Revisted.” This 106 room home has the distinction of housing the thrones used by the monarch and consort during the opening of Parliment, the owners, the 7th Marquess & Marchioness of Chomondeley can count Her Majesty as their next door neighbor. 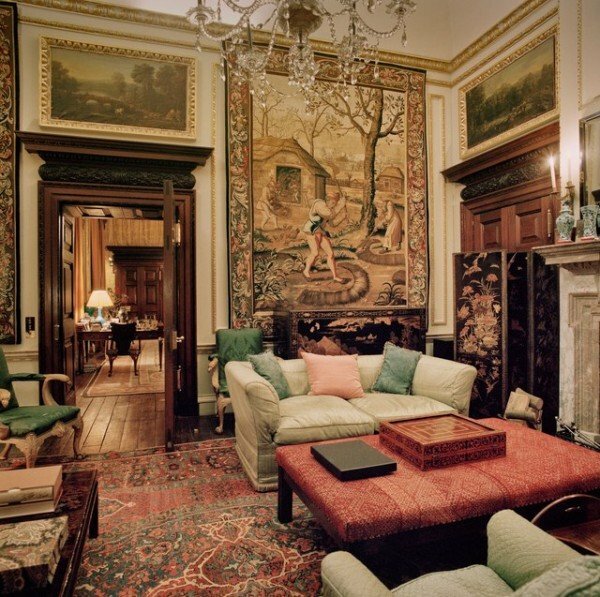 The home of Lady Pamela Hicks, wife of celebrated interior designer, David Hicks. The narrative of Lady Pamela is well worth a read, and who are we to spoil a surprise? 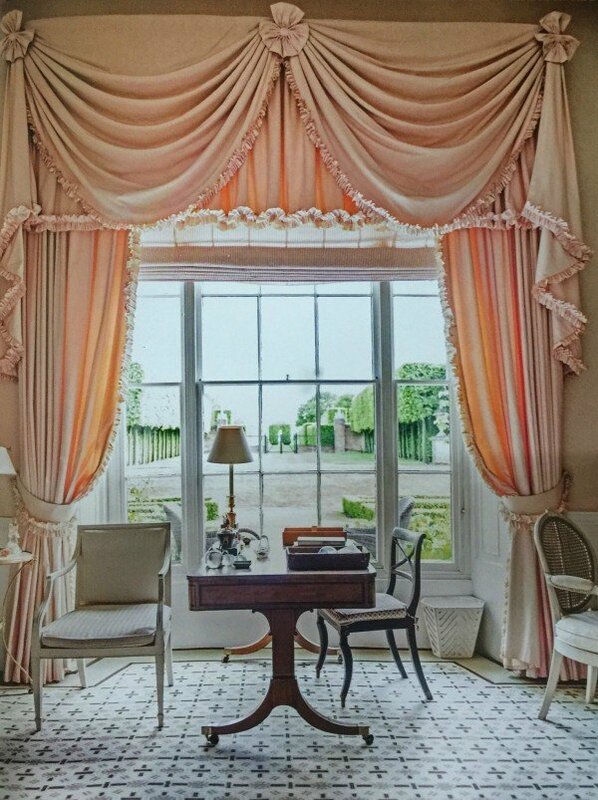 Pictured above: Pale pink curtains frame the drawing room’s view into the Grove’s famous gardens. 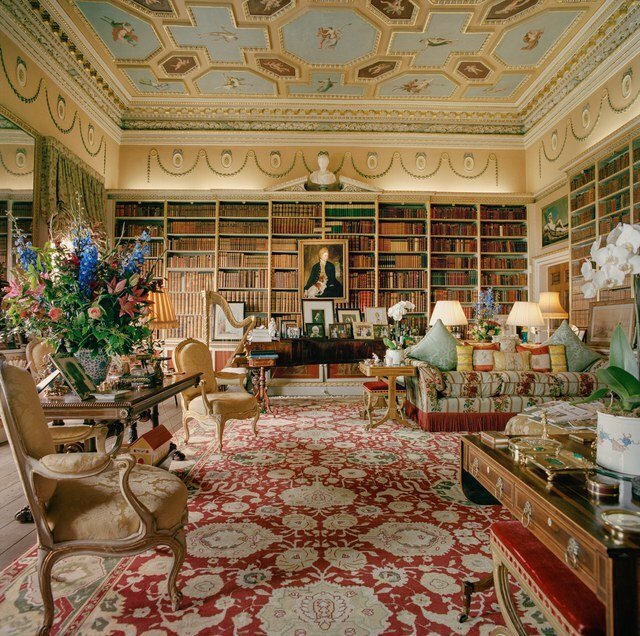 At some point in our lives, most of us downsize, including the Her Grace, the late Dowager Duchess of Devonshire. After living in a house with 297 rooms she moved into a home with only 8 bedrooms. The Dowager Duchess transformed the “Vicarage” with the help of eminent English designer David Mlinaric. Our unbiased opinion on this glorious book? Run don’t walk to your nearest bookstore. This is fascinating! I’d love to see the same thing in a French version–the decor would be quite different. Not judging better or worse, just different. I’d love to compare.